Crassula Erosula Height: Under 6 in. (15 cm) 6-12 in. (15-30 cm) Spacing: 15-18 in. (38-45 cm) 18-24 in. (45-60 cm) Hardiness: USDA Zone 9b: to -3.8 °C (25 °F) USDA Zone 10a: to -1.1 °C (30 °F) USDA Zone 10b: to 1.7 °C (35 °F) Sun Exposure: Full Sun Sun to Partial Shade Danger: Unknown - Tell us Bloom Color: White/Near White Bloom Time: Late Winter/Early Spring Late Fall/Early Winter Mid Winter ..
Campfire Crassula Category: Succulent Family: Crassulaceae (Stonecrops) Origin: South Africa (Africa) Evergreen: Yes Red/Purple Foliage: Yes Flower Color: White Bloomtime: Summer Synonyms: [Crassula 'Blaze', C. 'Flame'] Height: <1 foot Width: 2-3 feet Exposure: Light Shade/Part Sun Drought Tolerant: Yes Irrigation (H2O Info): Low Water Needs Winter Hardiness: 30-32° F May be Poisonous (More Info): Yes..
Crassula Hobbit Crassula ovata ‘Hobbit’ is a small branched, shrubby succulent, up to 3 feet (90 cm) tall and up to 2 feet (60) wide, with interesting leaves, up to 2 inches (5 cm) long. 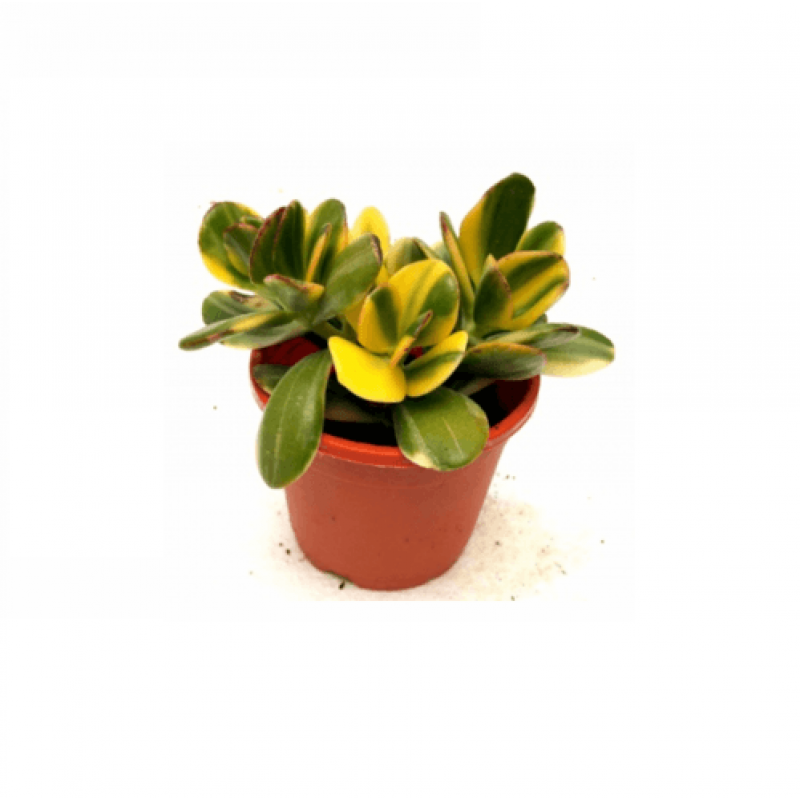 This is a very similar cultivar to the Crassula ovata ‘Gollum’, but while the cultivar ‘Golum’ has leaves that nearly tubular, the ‘Hobbit’ leaves are curled back around. The flowers are small, star-like, white or pinkish-white in color. Origin Garden origin (Nu..
Crassula Falcata - Propeller Plant Category: Succulent Family: Crassulaceae (Stonecrops) Origin: South Africa (Africa) Evergreen: Yes Red/Purple Foliage: Yes Flower Color: White Bloomtime: Summer Synonyms: [Crassula 'Blaze', C. 'Flame'] Height: <1 foot Width: 2-3 feet Exposure: Light Shade/Part Sun Drought Tolerant: Yes Irrigation (H2O Info): Low Water Needs Winter Hardiness: 30-32° F May be Poisonous (More Info): Yes..
Crassula Capitella Thyrsiflora - Shark Tooth Plant Category: Succulent Family: Crassulaceae (Stonecrops) Origin: South Africa (Africa) Evergreen: Yes Red/Purple Foliage: Yes Flower Color: White Bloomtime: Summer Synonyms: [Crassula 'Blaze', C. 'Flame'] Height: <1 foot Width: 2-3 feet Exposure: Light Shade/Part Sun Drought Tolerant: Yes Irrigation (H2O Info): Low Water Needs Winter Hardiness: 30-32° F May be Poisonous (More Info): Yes..
Crassula Humbertii Category: Succulent Family: Crassulaceae (Stonecrops) Origin: South Africa (Africa) Evergreen: Yes Red/Purple Foliage: Yes Flower Color: White Bloomtime: Summer Synonyms: [Crassula 'Blaze', C. 'Flame'] Height: <1 foot Width: 2-3 feet Exposure: Light Shade/Part Sun Drought Tolerant: Yes Irrigation (H2O Info): Low Water Needs Winter Hardiness: 30-32° F May be Poisonous (More Info): Yes..
Crassula Sarmentosa - Lemon Lime Jade Plant Category: Succulent Family: Crassulaceae (Stonecrops) Origin: South Africa (Africa) Evergreen: Yes Red/Purple Foliage: Yes Flower Color: White Bloomtime: Summer Synonyms: [Crassula 'Blaze', C. 'Flame'] Height: <1 foot Width: 2-3 feet Exposure: Light Shade/Part Sun Drought Tolerant: Yes Irrigation (H2O Info): Low Water Needs Winter Hardiness: 30-32° F May be Poisonous (More Info): Yes..
Cyanotis Somaliensis - Kitten Ears, Fuzzy Green Succulent Plant Category: Succulent Origin: South Africa (Africa) Evergreen: Yes Red/Purple Foliage: Yes Flower Color: White Bloomtime: Summer Synonyms: [Crassula 'Blaze', C. 'Flame'] Height: <1 foot Width: 2-3 feet Exposure: Light Shade/Part Sun Drought Tolerant: Yes Irrigation (H2O Info): Low Water Needs Winter Hardiness: 30-32° F May be Poisonous (More Info): Yes..